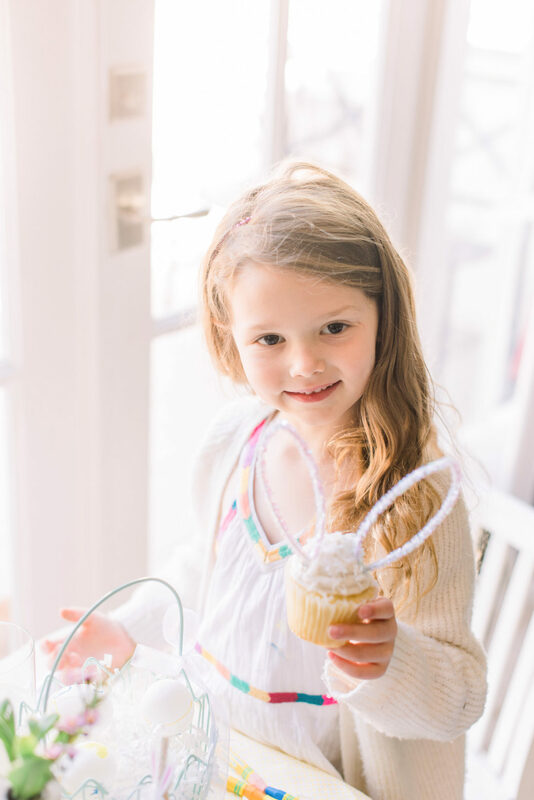 Easter is the sweetest springtime holiday, and there are few things better than celebrating holidays with the ones you love! We went out to Los Angeles recently as a family, and it was so fun to visit with everyone we miss so much since moving east. 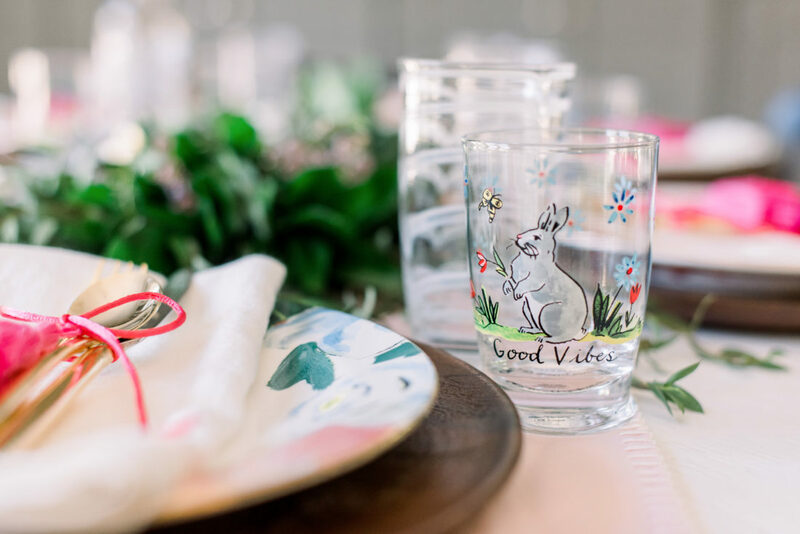 While there, I thought it was the perfect opportunity to work together with my friends at the new design blog The Happy Place on a fun, festive, and family-friendly entertaining concept for Easter! Joanna Garcia Swisher, Actress (and now blogger!) and interior design expert, has the most gorgeous home. And it served as the best backdrop for our party! 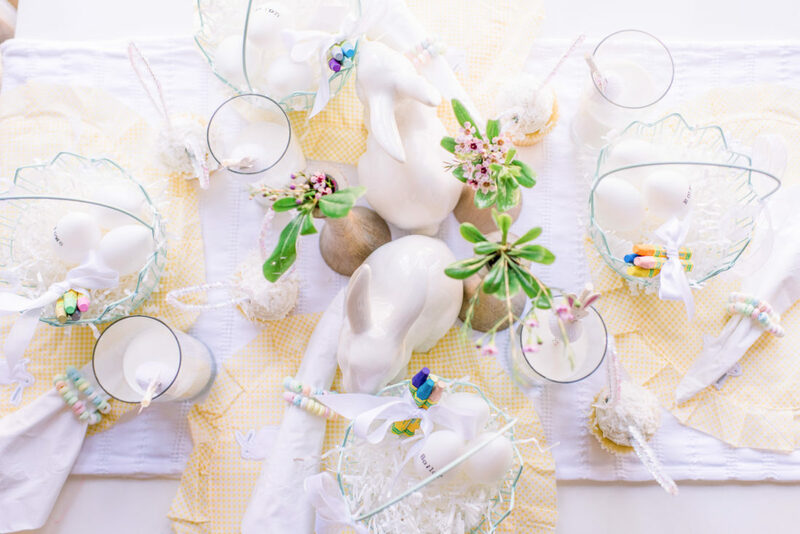 I had Jo design the Adult easter table, while I used my kids’ party entertaining skills to come up with the perfect design for the kids’ table and some sweet and easy activities. I love how everything turned out! 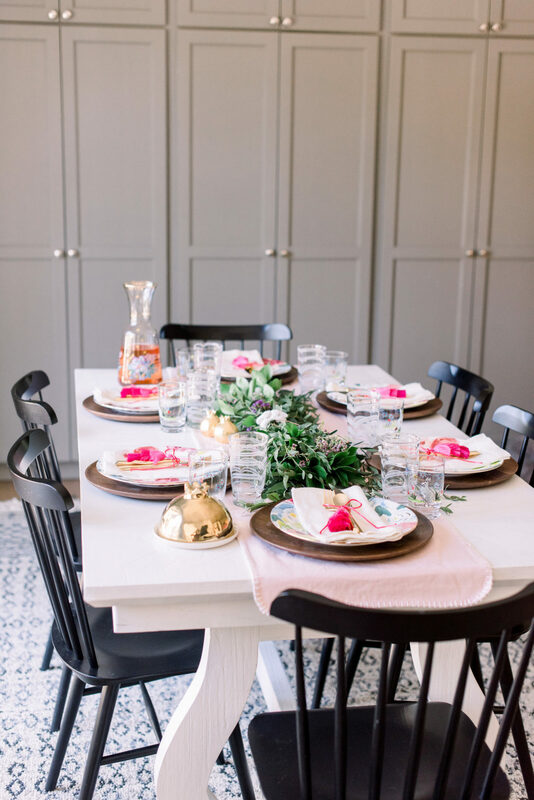 For the kids’ table, I wanted to focus on pretty pastels, and decor that serves a function. 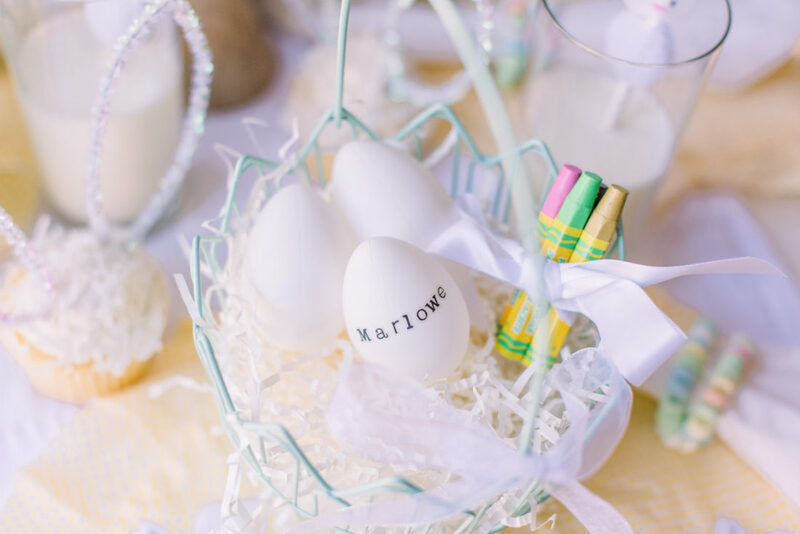 For each place setting, I created cute Easter baskets with a few hard boiled, white eggs, and a little bundle of pastel crayons to decorate the eggs! Letter stickers on one egg were easy ways for the kids to identify their seat. My other favorite decor touch were the SUPER simple cupcakes. 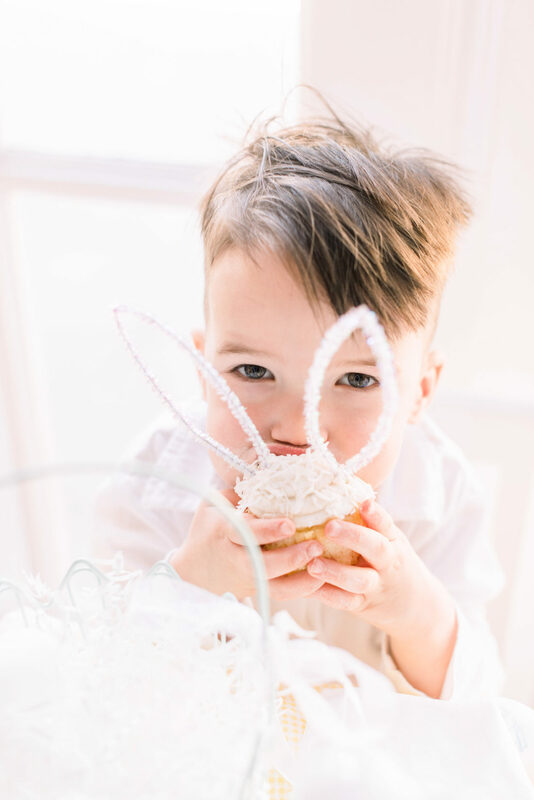 I just bought vanilla cupcakes with vanilla icing from the grocery store, and then jazzed them up with coconut flakes and bunny ears! I just used two sparkly pipe cleaners to make bunny ears. It was so fun watching our kids mingle at their little table together! I absolutely love the table Jo put together also. It was so fresh and emblematic of spring without feeling so over-the-top Easter-y. I especially LOVED the little water glasses! Too sweet. It was so nice to sit down together, enjoy a glass of wine, and just chat shop a bit. It’s funny but after three years of blogging, I still feel like a novice at times. Every day is still such a learning experience– and I sometimes forget that in reality I have learned a TON over the past few years. It was funny to be able to impart a few words of wisdom for my friend. 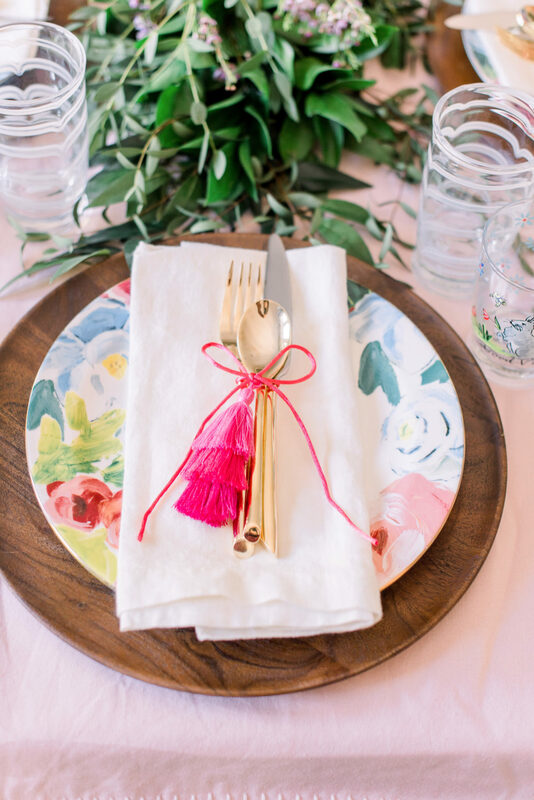 Her stuff is gorgeous by the way– make sure to follow her if you love interior design! Easter is just around the corner, and I’ll be cooking at home this year for my family. I thought I would share what I’m making below in case it can be helpful for you! 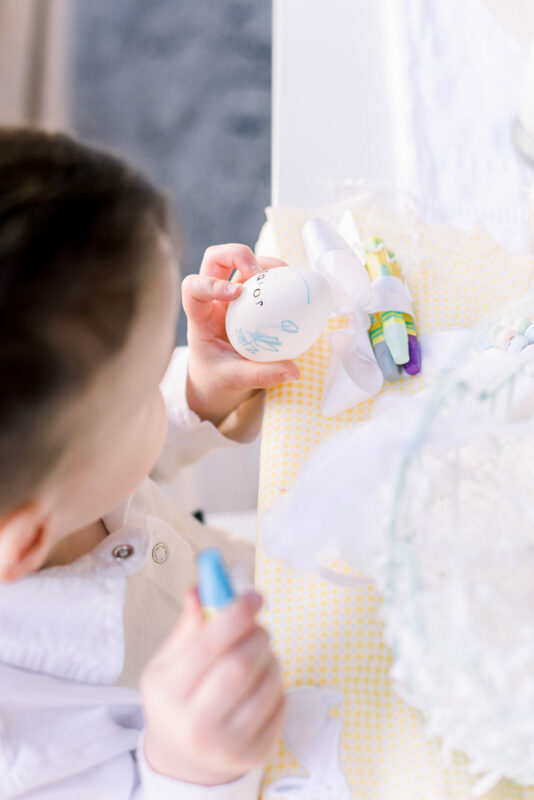 What is your most special Easter tradition? For as long as I can remember I absolutely loved an egg hunt. There was something so exciting about finding all the hidden eggs around our yard. I used to make my parents hide them over and over! Now as the girls are getting older, I see that it’s just as fun for them too! So I’m prepared for at least 50 egg hunts this Easter! 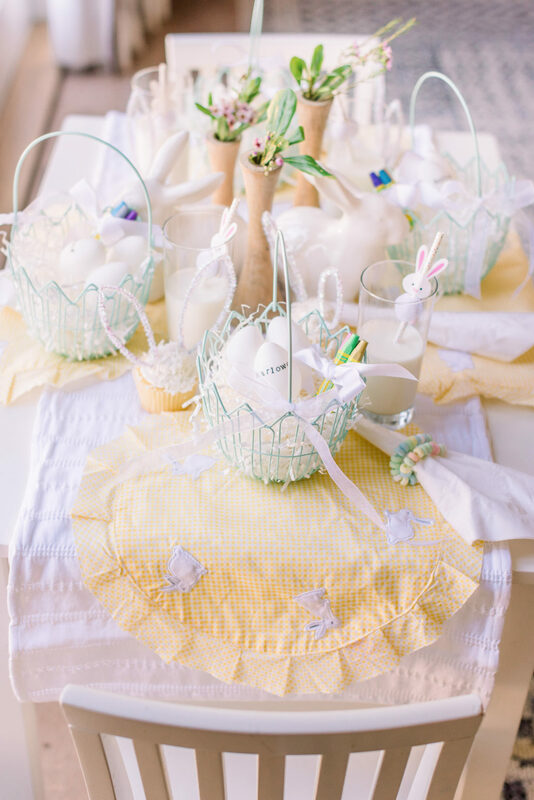 What is an Easter Basket MUST HAVE in your book? 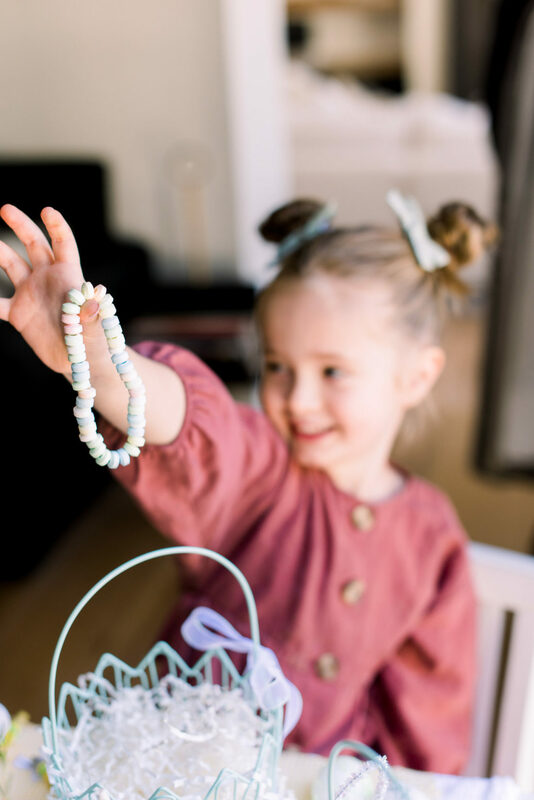 Growing up our Easter baskets had the standard peeps and jelly beans. But my mom always tucked something special in ours as well. A cute pair of sunglasses or a cute water bottle are always fun. Even a journal and specialty pen! This year I found these adorable snow globes at Home Goods that I know the girls are going to love! You have a passion and flair for design– what is your best advice for decorating a home with entertaining in mind? Design and decor are my happy place and truly the foundation for what The Happy Place is! For us, we are always entertaining. I can whip up a party in no time because I have some great basics that can function on many levels. 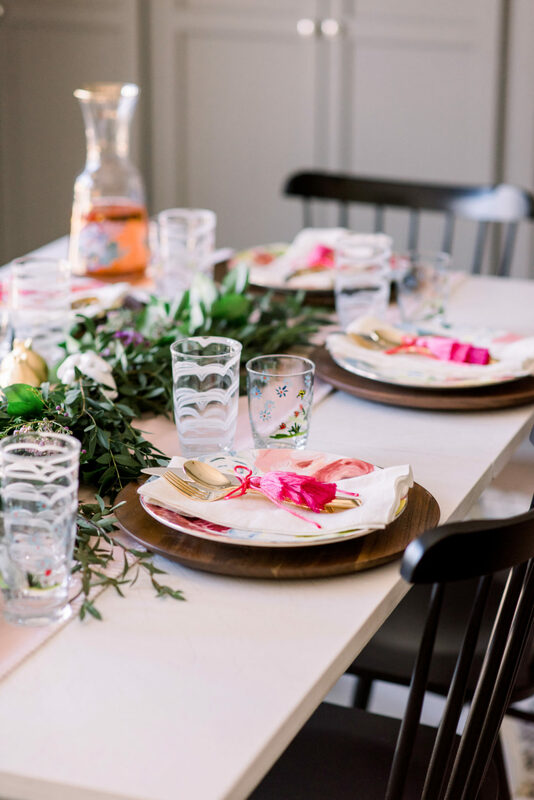 A few basic white serving platters, a cake plate, and a great beverage server can easily be transformed with any theme or occasion you have in mind. What is an absolute Hostess Faux Pas? 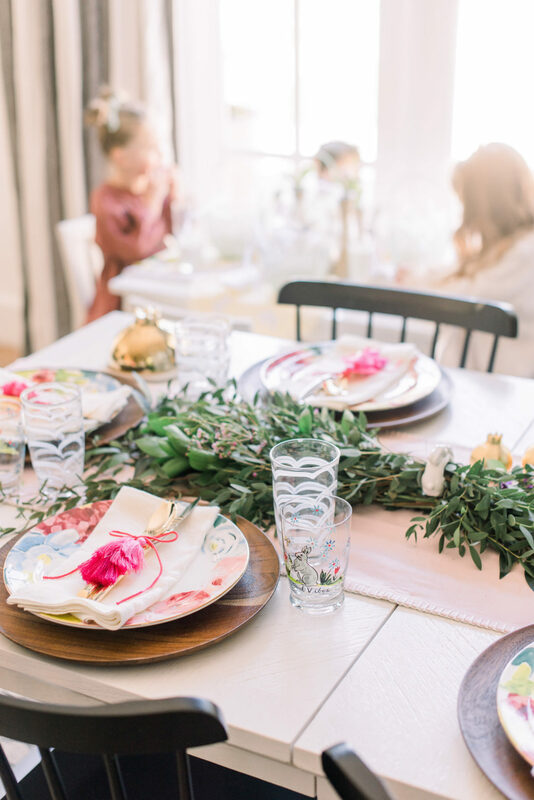 A stressed out hostess is probably the easiest way for your guests to feel uneasy. I always stress at The Happy Place that making memories and enjoying a good party are never about perfect decor and flawless presentation. It’s about the experience, the moment. So go easy on yourself! 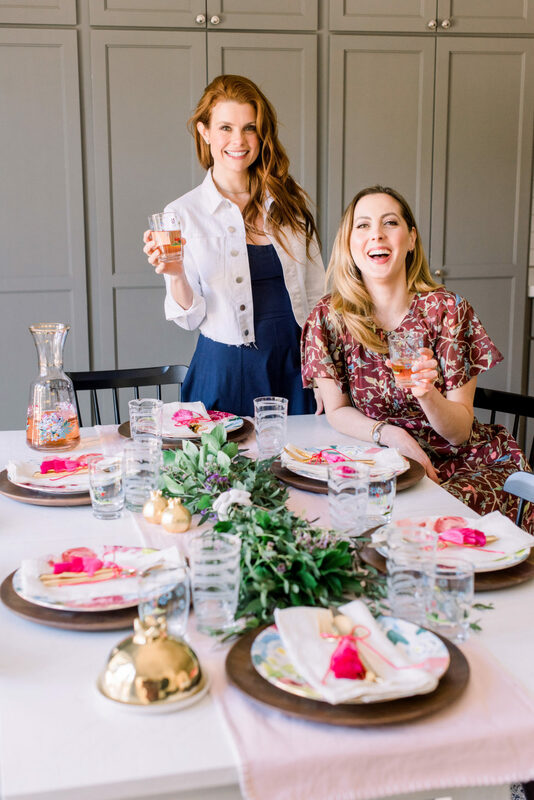 I promise that you are more likely to have your guests leave talking about how little fun you seemed to have much more than if the bread was burned or there were some mismatched plates! Name 3 dream Easter Supper guests. Besides me, OBVI. Lol. Oh boy! This is a good one! If I can’t choose you as one, I will have to go with someone else I know will drink all the wine with me! How about Prince William and Kate Middleton?! 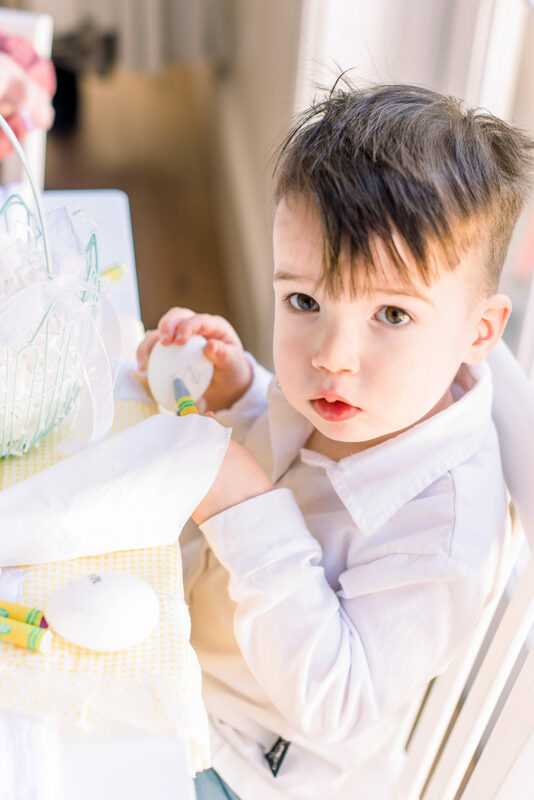 We would for sure have to brush up on our table manners, but for some reason I see the glimmer their eyes that they know how to have some wild fun! And keeping with that idea, I think the Obamas could really let loose and take our Easter supper to another level! Oprah seems like she would be top on a lot of lists, but I love her and would kill to share a meal with her too! Do you want to read a special interview I did for The Happy Place? Head on over there and see what we chatted about!